BRUSH|REED is a collaboration between artist and musician to explore the parallels of painting and sound through live performance. BRUSH|REED engages an audience through color, pitch, representational lines, rhythm, intensity and expression: an auralvisual experience. Tis the season! Local art shopping event on the first floor of the historic Casket Arts Building. Be the first to view the newest work by Linnea Maas of Inside The Robot during this extra special preview evening. For Collectors, Curators, and People of Discerning Taste, an evening of Art, Craft, and Design. Come for a free, guide-led Studio Tour, which will get you extra insider info from the artists themselves. The night also features free valet, catering by Jax Cafe, and a cash bar by Vikre Distillery with proceeds benefiting Compas.org. Ice Cream with the Artist! 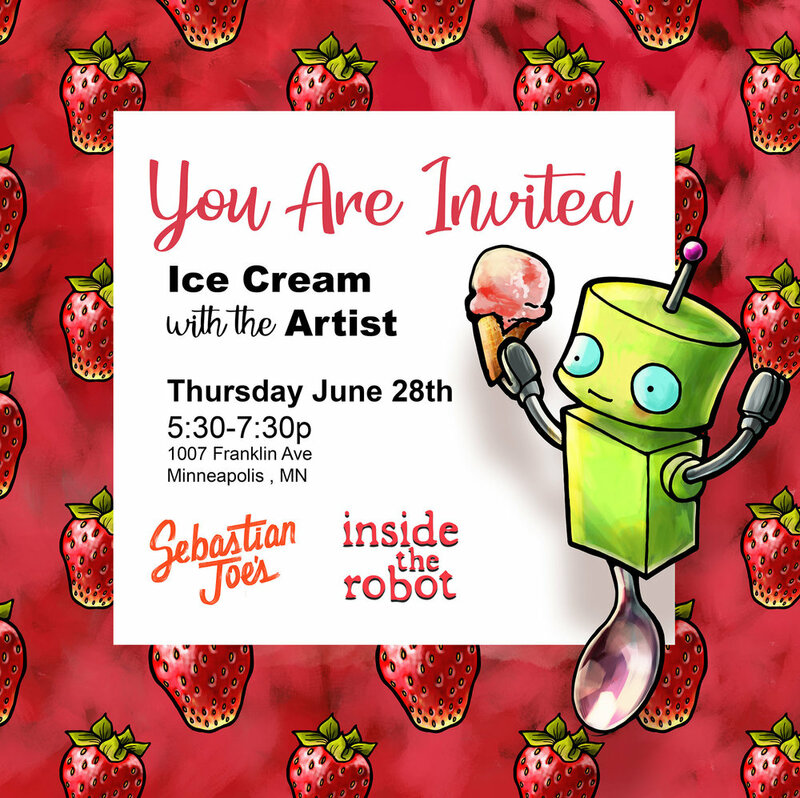 Join zee arteest for the Artist's Reception of the Peachy Keen Robots & Ice Cream exhibit at Sebastian Joe's uptown Minneapolis location. Meet the artist, learn more about the artwork, and enjoy special nibbles and refreshments. It's time again for the nation's largest art crawl, right here in Minnesota. This amazing 3 day event gets the whole Arts District hoppin'. Don't miss it! More info coming soon! Inside The Robot will be open all weekend long, with new art, specials, and zee arteest ready to meet you and say hello! Super Saturday Art Edition! Studio 317 of Casket Arts will be open to the public with a special guest artist. Get your Holiday Cheer in local art form! The Casket Arts artists are hosting a festive marketplace on Saturday December 9th. Join us throughout the first floor of the building for shopping, treats, and merriment. Inside The Robot will be selling prints, greeting cards, framed art, original works, magnets, canvases, and other sweet gifts. We will be located in the main lobby next to the elevator. Join us for our annual fall campus-wide event! Open studios, local artists and makers, live music, food trucks, and more. Our many talented tenant artists will open their studios and exhibit exciting new work. Guest artists will line the hallways, showcasing their artwork, jewelry, apparel, and more. The entire Casket Arts campus will be alive with activity, from jewelry-makers at Quench Jewelry Arts, to live folk and americana music on the 4th floor, to sculpture in Franconia in the City’s gallery… not to mention open studios and hallways filled with the best artists in the Northeast Minneapolis Arts District. Beer sponsored by Franconia Sculpture Park, The Draft Horse, and Surly Brewing Company. Have you ever seen a saxophone make color? Or heard acrylics play Bach? Check out the BRUSH|REED project, an ongoing collaboration between painter and musician - performing in Minneapolis on Sunday, 22 October. I'm exited to be part of the Enticing Entertainment Showcase on Tuesday, September 12th! I will be live painting alongside the dazzling crew of talented performers. Aerial Artists & Acrobatics - Stilt Walkers & Contortionists - Video Mapping & Virtual Reality - Elaborate Costume Characters & Creative Catering Concepts - Showstopping Performances & Unforgettable Experiences. Enter the world of Enticing Entertainment and witness our breathtaking performances up-close! 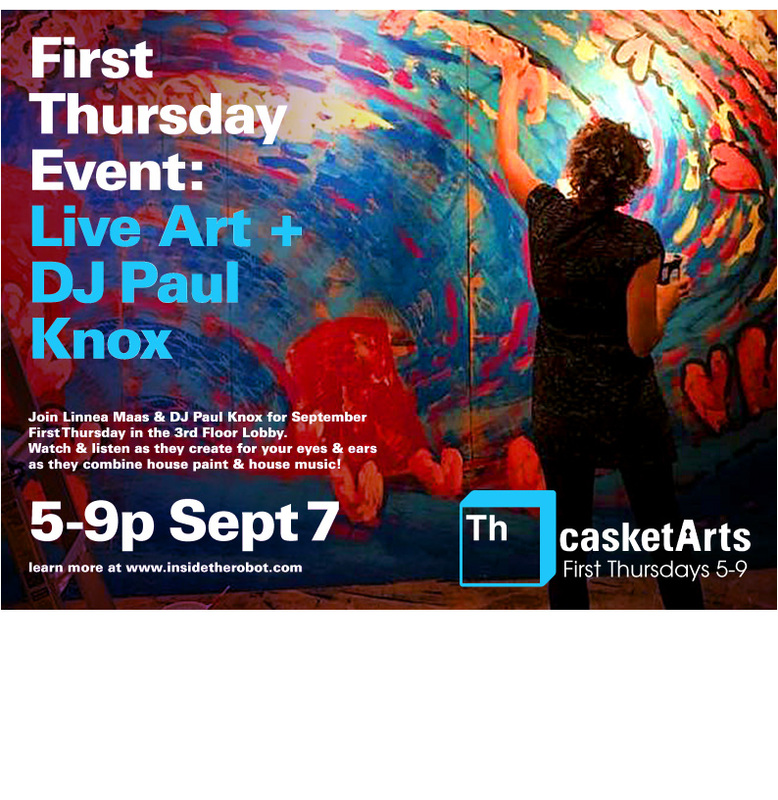 Join Linnea Maas & DJ Paul Knox for September First Thursday in the 3rd Floor Lobby at the historic Casket Arts Building. Watch & listen as they create for your eyes & ears as they combine house paint & house music! Rain or shine, get your art and free coloring pages at Inside The Robot - this month, exhibiting at Studio 164!!!! The Second Annual Summer Shindig! Casket Arts is taking the party outside for summertime! Enjoy our mini block party art fair and get local art, live music, food from Butcher Salt, frozen treats from Fro Yo Soul, and art activities for kids of all ages! Open Studio at Casket Arts! Come for a summer evening of Robot art. Don't love the Art-A-Whirl crowds? Easy solution: visit early! First Thursday Open Studio is a self guided tour of the working art studios in the Northeast Minneapolis Arts District. Join Inside The Robot at Casket Arts Studio 317 to visit zee arteest and see what's on the drawing board. Open Studios! A Self Guided Tour of the working art studios in the Northeast Minneapolis Arts District. Join Inside The Robot at Casket Arts Studio 317 to visit zee arteest and see what's on the drawing board.